This information affects anyone who is currently selling “anything” at all online even if you are a small player with a small online income. Just like a brick and mortar business, your online business is subject to legal scrutiny. Unfortunately, many newcomers to online marketing are not even aware that they can be targeted by the FTC. Seemingly “harmless” stuff that you may be doing right now can get you fined, sued, and even sent to prison by the FTC (yes, even if you have absolutely no idea that you’re doing anything wrong or “illegal”). Should you read this post in time, you can attend this free webinar “How to Leverage Facebook’s Custom Audience & Other Ads Platforms While Avoiding FTC Claims & Network Suspension”. It is something pretty important to your online future. For example, Facebook’s Custom Audience and other ad platforms allow you to leverage your conversions and ad budgets through ad retargeting, but… there’s a catch. You need to comply with Facebook & the other ad networks… and FTC Regulations or risk being suspended by the networks and sued by the FTC! Attend this free Webinar. And if you missed it, here’s another link that will get you the information you are seeking. I’m just trying to help educate you about what’s really going on right now. Because the fact is, this “nightmare scenario” can be easily avoided if you simply have some basic information about how to protect yourself and your business. Your online business assets may be at risk and in a world full of sue-happy people, and a Federal Trade Commission (FTC) that has started taking a hard look at online business owners, you’ve got to do all you can to protect your business. This means you’ve got to have *proper* legal notices and disclaimers displayed on your website. And I say *proper* because, those boiler-plate privacy policies most businesses are using isn’t enough to protect you. You’ve got the FTC, and then you’ve got the equivalent of 50 “Little FTCs” that you need to stay compliant with. You see, every State has its FTC equivalent, and California leads the way with its California Online Privacy Act… And it doesn’t even matter if your business is in California, or some other State. You need to comply with the rules from every State as well as the FTC itself, if you want to do business online these days. You can do a quick audit of your online business and know if you’re compliant and where you stand in literally minutes. So if you missed that getting in on the above webinar, then I suggest you use the link below to at least see if your online business is risk. 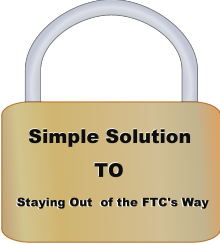 ==>Staying of FTC line of sight. Marie is a seasoned online coach and marketer helping newcomers save time and money in applying sound internet marketing processes and providing them with versatile tools to ease their lead generation frustrations. Are Your Online Business Assets at Risk From the FTC? Which Marketer Type Do YOU Fit In? Other Marketers Do This – It Works For Them – It Works For Me – What About You? Copyright 2012 -2019 by Marie Leonard Online.